I gave it a five star rating, HOWEVER, I'm reducing that to 2 star because They make you write something in the review. IF YOU WANT THE CUSTOMER'S RATING, Then be satisfied with what the customer gives you PERIOD!!!!!!!!!!!!!!!! Visconti Jaws BD12 Black Leather Tall Checkbook Wallet 4" x 6.5"
Store your credit cards and ID in a secure, handy way with this RFID credit card wallet. Fashioned from Italian top-grain leather for a sophisticated look, this wallet is fashionable and professional. Dimensions 4.25 in. x 6.63 in. I looked long and hard to find a replacement for my old, worn out leather wallet. I wanted one with may pockets for credit cards, IDs, etc, with pockets for bills and notes under the card area. I almost gave up the search, as it appeared no one makes them in this style, when I stumbled across this model at Overstock. It fits my need beautifully, with more than enough card slots. I keep my wallet in my front pocket, so its size is just right for me. It is Italian leather, and very nicely constructed. I expect it to last quite a long time. This wallet had excellent quality, the leather was top notch. Plenty of room for ALL of your credit cards (or coupons, store cards, etc.). Overstock.com shipped super fast. Very pleased with this purchase. I have always loved my old wallet given as a Christmas gift 30 years ago. It was the best, held a good number of credit cards, a place for my license,and for cash. I thought I would never find another like it. But I saw the Columbo Long Credit Card Wallet on Overstock and thought why not give it a try. It is fantastic. High quality leather, holds 21 cards and has a place for cash. I had read that the License holder was hard to extract a License from so I put mine in a Credit Card slot and the problem is solved. I am now happier with this new wallet than with my old reliable. Great Product. I just received this fine wallet. It's very simple, and plain, and yet it looks very expensive and elegant (real leather), at least the cognac color I ordered. I have a very expensive wallet, but I cannot carry all my cards at once. With this one absolutely no problem at all. I have more than twenty, plus two large pockets for bill/receipts. The price is very low in comparison with other ones. I like the size, you can fit it nicely in any normal pants or shirts pockets. Go for it!! I've been looking for a credit card that would accommodate 18+ credit cards. After unsuccessfully searching for the wallet at countless stores, I decided to check out overstock.com. The Colombo Long Credit Card is just perfect! I would highly recommend this product! It is strong, clean, and neat. I looked long and hard to find a replacement for my old, worn out leather wallet. I wanted one with may pockets for credit cards, IDs, etc, with pockets for bills and notes under the card area. I almost gave up the search, as it appeared no one makes them in this style, when I stumbled across this model at Amazon. It fits my need beautifully, with more than enough card slots. I keep my wallet in my front pocket, so its size is just right for me. It is Italian leather, and very nicely constructed. I expect it to last quite a long time. Purchased this Christmas for my husband, who had always carried a basic leather wallet. His ATM card literally broke off on the top portion, "twice" in the last year, due to the fact that his cards were all bunched in his traditional wallet. I've just asked him what he liked most about this wallet, he says "the fact that it was so thin now", compared to the "thickness" of the regular types he'd carried in the past. I'm sure now it has to be more comfortable to carry, not to mention to sit on, now that it is no longer 3" thick! It's just a very nice wallet. And a special "Thank You" to Overstock for the price! Recently purchased this item since I seem to carry a lot of cards but I also carry lots of bills like one's, five's, ten's, twenties, and so on. So I also needed a capable bill holder and I saw this one had two bill holders. I was pleasantly surprised as to how it absorbed all cards and how neat and low key it closes. As for the bill compartments they were tight which I attributed to the new leather and still waiting if it will be easier to carry currency like on a oversized bi-fold, which is what I was using before. The bi-fold seemed to handle the bills with more composure but the Colombo Long Credit Card Wallet, as its name so implies, is the clear winner for carrying cards without a hassle. If the leather cedes and my bills gain ground I will be most satisfied for I killed two birds with one shot, sort of speak. I like it enough to rate it 4 stars and if it loosens up, well, the sky is the limit. Either way did not think once about returning this item and it is easy to carry around because of its low profile. Until the day comes when one rfid coupled with biometrics can consolidate all my plastic into one card, something like this is a necessity. This does the job I need it to do in handsome fashion. My wife bought this wallet for me as a birthday gift and I absolutely love it. At first I only used it for business travel but now use it every day. Great craftsmanship and design. I can now keep my work related cards& ID's separated from my personal cards. It took some getting used to pulling my wallet out of my inside suit jacket pocket and don't see myself ever going back to carrying a wallet in my rear pants pocket. ( A money clip does just fine on the weekends!) Plenty of space for cash, receipts, id's, credit and rewards cards. Best of all, this wallet is not bulky and fits nicely in to the inside pocket of a suit coat or blazer. I had been searching for a wallet like this for over six months. Every store I would go into and nothing. I went on line to many websites and nothing. I went into my email and like always I had a email from Overstock.com and I started looking on web page and there it was. I ordered this wallet and when I got it I was very pleased with the price, quality and that it had 20 slots that would now hold all my charge cards. Finally I had what I wanted and it only took five minutes on Overstock and over six moths looking elsewhere. This wallet is top of the line and you will love it. Great shipping as always. Thanks to Overstock.com for bringing us nice items at a low price. For people who have a lot of credit cards and want easy access to them at a glance, this is a excellent solution. This is not a "back pocket" wallet - too large and flat for that. The quality of the leather is better than I expected for the price. The slots are a snug fit for the cards, but will ease with use. All in all, I'm very satisfied. well made but quite large for fitting in a pants pocket. I love this wallet. I have had it for a year and still looks brand new. Holds several cards and is RFID. I surely recommend this wallet. Well worth the money! It was nothing like it was shown in the picture not worth the money. Exactly what I wanted. It arrived sooner than I expected, and is well made. It should last a long time. Would recommend it to anyone who needs large card case. Great! Comfortable and silky feeling! It fits my king great! It’s not as big as I thought, which, is a good thing. The quality is great, I just have to use it more, meaning; taking cards in and out to break in that process. Being new, it’s a bit tight. Exactly what I was looking for. Has held up well. "I need assurance that the black wallet is like the cognac. The photo for the black color does not look anything like the wallet I'm looking for." They are the same, just different colors. "The name of the Wallet is the Colombo RFID credit card wallet yet in the descriptions nowhere does it entail about the RFID features. Does it really have that security feature?" Inside the wallet it is stamped RFID secure. It is a very nice wallet. As of today I haven't had a problem yet security wise. "I am wondering about the color. 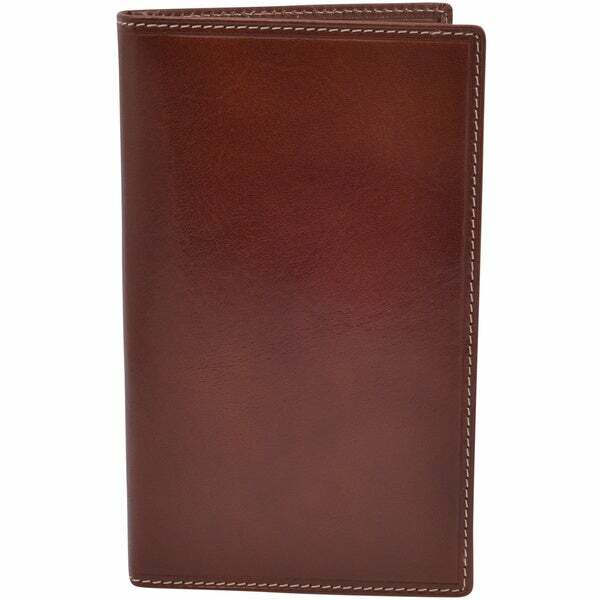 When the cognac wallet is pictured by itself it has a darker color. When it is pictured beside the black wallet it is much lighter and looks more orangy. I am wondering which color is more accurate." I have several purchased over the years, both black and cognac. My take is that the cognac is true to its name, but some might associate the color with light brown? Very nice, though, I would wait for a nice sale to purchase. "Yes, it did come in a box. It's a Beautiful Walett, and would in courage you to make the purchase." "Is it come with box? " Yes, it came packaged in a box that was worthy of gift giving. Yes, it comes in a box. Gave away as a gift in the box/ package that it came in. "Is there room for a checkbook and register?" Hello kellyjs, this wallet is designed mostly for credit cards only. It will likely be too small for a checkbook and register. Please let us know if you have additional questions. Thanks for shopping with us. "When will the black be in stock again?" Hello Richard.Kissick, items are restocked as they become available; however, we cannot guarantee an item will be restocked. Thank you for shopping with us.